This weekend, I went on a little getaway to Los Angeles, Ca. Did some swimming & napping, after lunch at Stout, on the patio, on Santa Monica Blvd. I’m a sucker for anything with an egg on it, so this captured my attention, instantly. They have a rule that you can remove ingredients from your order, but not add/ personalize, which made me a little sad because anyone that knows me knows I add extra tomatoes to everything, but hey I can’t always make the rules. I should have thought about the whole “Chipotle Ketchup” thing, because I’m not crazy about chipotle/ barbecue sauce, I ended up just eating the burger without the top bun & ketchup. The beef was cooked medium rare & the rosemary bacon was a perfect pair. 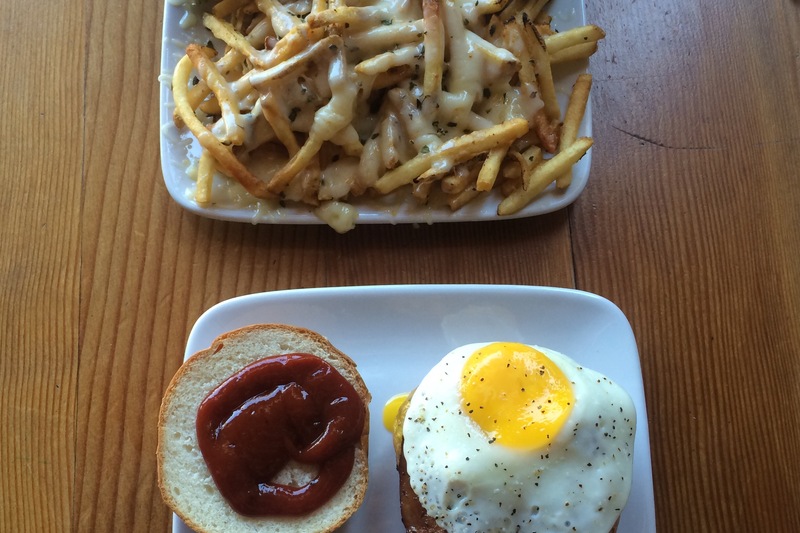 I’m not sure I’d go back for a burger, but I would 100% go back for the Mozzarella Fries & Lemon Basil Aioli. For some reason the mozzarella fries aren’t featured on the menu, but they were thee highlight of the meal. & for the lemon basil aioli I had for the first time yesterday, I’m already dying to get my hands on some more. I would say if you’re on the Santa Monica Beach & you’re looking to get something to snack on these fries & sauce are a must.